JCU researchers are preparing to release baby turtles into the ocean next month with trackers attached, the first time JCU has undertaken such a project. The impossibly cute turtles will be fitted with GPS trackers, so researchers can understand their movements, where the live, and how they navigate the ocean currents. The project, Habitat use of juvenile flatback turtles in eastern and Western Australia, is being led by JCU’s Associate Professor Mark Hamann and Professor Jeanette Wyneken from Florida Atlantic University in the United States. The project is is being held in collaboration with Florida Atlantic University and the Western Australian Department of Environment. This is the first year of the project. Associate Professor Hamann said the project involved 26 baby turtles, who are all about two months old, and are being cared for in tanks at JCU’s Townsville campus. 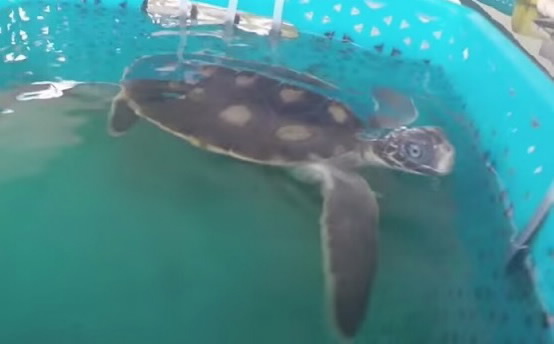 “The turtles are being fed and nurtured until they gain about another 100g each, in order to be strong enough to be released into the ocean in the Whitsundays or near Rockhampton, in about a month’s time,” Associate Professor Hamann said. The baby turtles are fed each morning with a mixture of turtle pellets, or pet turtles food – made of fish and carbohydrates, baby porridge and bread, which they devour with gusto.